After quite an ordeal we finally have broadband, and wireless at that! To say it wasn't plain sailing would be the understatement of the year. Suffice it to say that according to Telecom we should now have three modems!!!!!! even though one would have done. In reality we have two again one modem to many. After numerous phonecalls, calling into Telecom shops it is finally here. It was such a painful experience I was going to do one complete post about it, but the memories are still all too painful. Anyway we ventured to the South IsIand for the first time at the weekend. Our destination Picton via the Interislander Ferries. When we first thought about going to NZ I thought there would be a bridge running between the islands! Well to be fair to me I did think, rather incorrectly that NZ was about the same size as Ireland. Instead it takes three hours by Ferry. It won't surprise you to learn then that there's no bridge! We arrived in Picton on Thursday afternoon, the plan to stay one night and move on from there, final destination unknown. We will do a separate post about our tramping adventures later but for now I want to return to one of my favourite past times, drinking! "Well you see, Norm, it's like this... A herd of buffalo can only move as fast as the slowest buffalo and when the herd is hunted, it is the slowest and weakest ones at the back that are killed first. This natural selection is good for the herd as a whole, because the general speed and health of the whole group keeps improving by the regular killing of the weakest members. In much the same way, the human brain can only operate as fast as the slowest brain cells. Now, as we know, excessive drinking of alcohol kills brain cells. But naturally, it attacks the slowest and weakest brain cells first. In this way, regular consumption of beer eliminates the weaker brain cells, making the brain a faster and more efficient machine. And that, Norm, is why you always feel smarter after a few beers." 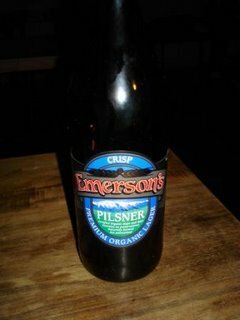 With the above incentive in hand it seemed like a good idea to have an organic NZ beer, which I had discovered previously, which is brewed in the South Island called Emerson's. 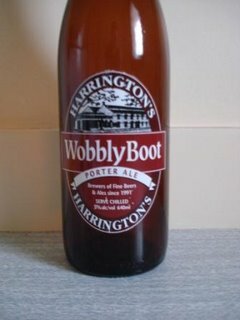 They have various styles and the picture below is of a Pilsner. The Pils was very nice and had a real hops taste off it. 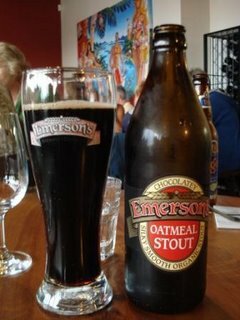 Alas they didn't have the Pilsner the night we were in Picton, but they did have a stout, yes that's right a genuine NZ brewed organic stout as the picture below will testify. Strangely enough when we arrived back to the hostel there on the counter of the kitchen was the following. It would seem that porter is not that uncommon in NZ after all and it also seems to have the same affect what ever country you're in!